I don’t generally find myself getting excited while sitting in the dentists chair but that all changed for me today when the email blasted across my Galaxy Note 4 about the upcoming tour for the mighty and most legendary Black Sabbath. Of course since I was being worked on at the time I had to compose myself or face an even worse problem at the hands of the man with the drill but now that I’m back at the Metal Command HQ I can share the poster, the official press release and toss in some additional thoughts for your indulgence. Let’s go. PiercingMetal Thoughts: Do I really need to opine any additional thoughts about the importance of catching Black Sabbath at least once in your Metal lifetime while the means is there to do so? I didn’t think that I did but in case I am wrong, are any of you surprised that the guys have decided to finish up with the Black Sabbath branding and pass the torch onto someone else. 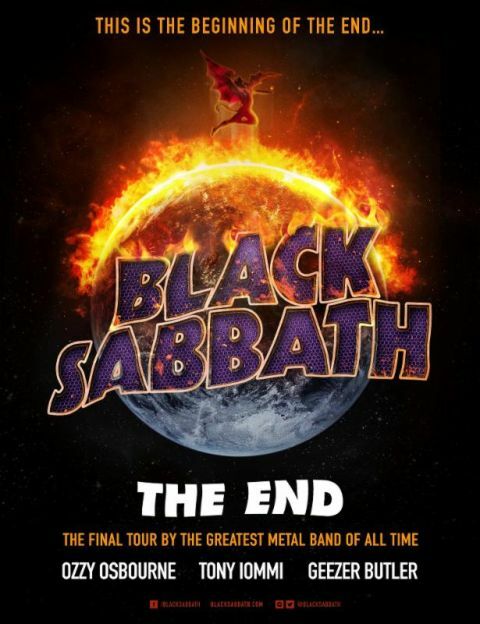 “The End” is such a grim way to think of the mighty Sabbath but they surely deserve time off to reflect and write more books and make special appearances while watching how Metal continues to grow thanks to their numerous lessons. I am going to do my damnedest to be a part of the NYC show at the great Madison Square Garden and this is a mission of mine since I missed that whole batch of “13” touring dates. Hey they just sold out too quickly and some of these gigs are not easy to work the magic on even if it is black magic (get it, hahahaha, sorry where was I). This might be a sad time as the Metal world witnesses some historic book closing but there is still time to revel in their greatness as they remind us for these number of dates just what made them so legendary. I can hear the chanting now……”Sabbath”, “Sabbath”, “Sabbath”…..go ahead, join in you know that you want to. So what are you readers thinking about this one? Are you psyched about it? Are you not psyched about it? If you answered the latter you clearly are not a Metal fan and clicked onto the wrong website but I hope you enjoyed your time here. Now scram 🙂 (kidding, you are always welcome to learn from this page). Comments are left open for you to indulge me in your thoughts. Bring them on. I knew the end was coming, but Its still a shock. I plan to see as many shows as I can. They did say more East Coast dates TBA in October.